Scientific name: Calosoma spp., Cicindela spp., Megacephala spp., Ophionea nigrofasciata, Pterostichus spp. Cabbage root maggots, cutworms, snails, slugs, (Ellis; Bradley, 1996: pp. 294-295), leaffolder and planthoppers larvae (Rice IPM, 2001). Eggs are normally laid singly in the soil. Larva is elongated and tapered toward the end, worm-like in appearance and have a large head directed forward. Pupa is brownish black, small and found in the soil. Adult ground beetles or Carabids are about 2-6cm long, dark shiny brown to metallic black, blue, green, purple, or multi-colored. They vary in shapes,- from elongated to heavy-bodied, - tapered head end with threadlike antennae, and have a ringed wing cover. Some species do not use their wings however, like many other insects they are also attracted to light. They use their wings to fly at night to be near to the source of light. Their heads are usually smaller than their thorax. 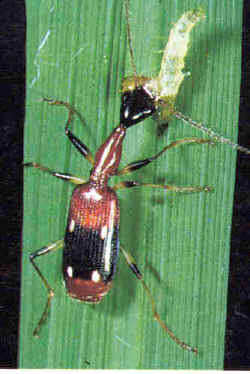 Both adults and larvae have strong pincher-like mandibles. They have prominent long legs, which make them fast moving insects. Most species are nocturnal and they hide during the day in soil crevices, under rocks and stones, decaying logs, leaf litter, or composting materials. When disturbed or when other vertebrates prey upon them, they emit an odor or gas, as a type of defense mechanism, preventing them from being eaten by other predators. Ground beetles live on or below the ground, hence the name. Development from the egg to the adult stage takes about a year, although adults may live 2 to 3 years or longer. Practice mulching in some sections of your field to provide a habitat for the ground beetles. Provide permanent beds and perennial plantings to protect population. Plant white clover and/or amaranth as ground covers (Ellis; Bradley, 1996: p. 295).